Thank you for all your continued efforts to support us on our fight to ensure that current this and future generations of Cotham School students have safe and secure access to our dedicated school playing fields at Stoke Lodge. For your reference please click here to view the proposed plan for fencing, including gates and (indicative) pitches. It is with some disappointment that I have to tell you that a body called the Commons Registration Authority has decided that a second application by Emma Burgess of the We Love Stoke Lodge group to register our school playing fields as a Town and Village Green (TVG) has been 'duly made'. This does not mean that the land has been registered as a TVG. Bristol City Council and Cotham both opposed this application on the same or very similar grounds and now have the opportunity to submit objections which the applicant must respond to. We'll be submitting objections and fully expect that Bristol City Council will also continue to object to the registration of this land and support our school. I will keep you updated on our progress on this matter. None of this affects our mobilisation plans to get back onto our playing fields and we'll continue to roll these out as planned. We still need your support, so if you haven't already, please sign our petition and view, 'like' and share the accompanying film made by friends and supporters of the School. Topics include how to support the school ensuring safe and secure access to our playing fields. The group is open to all parents and carers with children at the school. Please note that the page is run by parents and is not an official school Facebook Page. Please also find below my usual updates on events that have taken place this week, information, letters etc. Huge congratulations to Hannah Foster and Fenn Elliot (Year 11) who spent the first day of their christmas holiday singing in the galleries to raise money for 'War Child'. Click here to view January’s Newsletter. Year 8 exams take place in the weeks commencing Monday 4 February and Monday 11 February. Details of the style and content of each exam, as well as details of revision are given in the document here. A useful Revision Timetable template can be found here. The exams represent a good opportunity for students to get used to the demands of reformed GCSEs. Please encourage your child to complete revision over the next two weeks in advance of their exams. A timetable showing the days / times of the exams will be shared with parents and students in next week’s weekly mailing. Options Information Evening 5.30pm – 7.30pm on Wednesday 16 January. We warmly invite you to the Year 9 Options Information Evening. There will be presentations by members of the Leadership team in the main hall at 5.45pm and 6.45pm and the Information, Advice and Guidance Advisor, Mrs Chester, will also be present to offer advice on possible Post 16 education and careers options. Students will have seen the same presentation during assembly that day. The focus of the rest of the presentation will be the 2019-21 Key Stage 4 Curriculum and an outline of the procedure and the timeline for finalising options. There will also be an opportunity to take individual questions at the end of each presentation. Subject staff will be available to answer any questions that you may have. The Options Booklet will be distributed at this event. At the evening you will be able to discuss your child’s progress and suitability for particular subjects at Key Stage 4. Appointments for Parents Evening can be made using the online booking system (PES) accessed via the school website. Subject teachers are available from 4.00pm until 6.30pm. Students should attend the Parents Evening with you. In addition, Ms Quirke (Assistant Headteacher) and Mrs Bajic-Raymond (Senior Deputy Headteacher) will be running an Options Surgery to help with any queries, on Tuesday 29 January from 6.00 pm to 7.00 pm. As part of their careers and work-related programme and to support them in their upcoming GCSE option decisions, all Year 9 students will be playing the Real Game in P1-4 on Thursday 17 January. The Real Game provides students with an opportunity to explore different aspects of the world beyond education in a safe and enjoyable way. As part of the game, students are given a random job role and tasks which help them to develop employability skills and gain an appreciation of how qualifications relate to income levels and how adults need to balance income and expenditure in everyday life. All Year 9 students are being offered the Meningococcal ACWY vaccination and Diphtheria/Polio and Tetanus vaccination in school on Thursday 24 and Friday 25 January 2019. All students have received a letter, consent form and booklet via tutors and parents have been e-mailed the letter and consent form. Consent forms need to be returned to the Student Reception by Monday 14 January 2019. Students will not be vaccinated if no consent form is received. All information can be found on the school website here. Bristol Old Vic - applications close Monday 14 January 5pm. Drummer Television are offering Work Experience. Interview to take place at school. Please see Mrs Arnold if interested. SS Great Britain are offering placements - interviews will take place in school Monday 11 February. Application form to be returned to Mrs Arnold by 1 February. Careers in Science/ Engineering (1-5 July) – the week will include hands-on experiments with our Ship’s Conservation Engineer, how we communicate science to the public and taking care of artefacts (including the ship’s hull). Students will work as a team exploring a range of different science-based challenges and projects. There will be an opportunity to present their ideas to staff, students and parents at the end of the week. The week would particularly suit students interested in exploring careers in STEM. Careers in Museums/ Heritage (1-5 July) – during the week students will have the opportunity to explore what working for a museum and Bristol’s number one tourist attraction is really like. They will have the opportunity to take part in workshops with our marketing, interpretation, visitor experience and conservation teams. The students will be working on a group project which will also benefit the SS Great Britain with the opportunity to present their ideas to staff, students and parents at the end of the week. It might particularly suit students with an interest in history, tourism or the arts. Mock exams for Year 11 will take place from 21 January to 1 February 2019. The timetable for these exams can be seen here. All exams will take place in the Sports Hall unless otherwise stated. Students must be in full and correct school uniform and have their lanyard with them at all times. They need to ensure that they are in school for 8.35am every day. Students taking morning exams at 8.40am should go straight to the exam hall (they do not need to see their tutor). All students will be given a copy of their own individual timetable showing their seating plan, which they must carry with them at all times. Some students will have exam clashes but their timetable will confirm which exam they should attend. Any exam missed as a result of a clash or absence will be completed during Thursday 31st January and Friday 1st February. It is important that every student ensures that they are in school to complete these mock exams. Exam rules are strict and we want the mock exam period to replicate the period of GCSE exams as closely as possible. Students are not permitted to take mobile phones into the exam hall. We are unable to guarantee the security of students mobile phones whilst they are in exams and advise all students to leave their phones at home. A template revision schedule can be found here. A list of recommended revision guides can be found here. Students should also make use of GCSE Pod and SamLearning online revision resources. Post Mock Parent Information Session Thursday 7 February. Term 3 ends on Friday 15 February. When we return on Monday 25 February Year 11 will have only 35 school days of learning before their formal GCSE exams commence. We therefore want to ensure that all of our students are using the February holiday to thoroughly review their strengths and weaknesses identified by the January mock exams and acting on the feedback given to them by their teachers. We would like to invite our Year 11 Parents in so that you understand how feedback will be given to students following their mock exams and so that you can support your child with their revision over the February half term and during the 35 school days that remain when we return on February 25. The session will run on Thursday 7 February from 5.30pm to 6.30pm. Parents should arrive and enter the Main Reception on Cotham Lawn Road. Directions to the main hall will be visible on the day. ‘Upgrade’ sessions are now part of the school’s provision for all students who will benefit from extra support intherun up to their mock examinations in January. Initial student feedback has been really positive, with many finding the time useful and productive. Students say they find Upgrade particularly helpful for organisation, time management and in the development of effective revision methods. Students can access support from both staff and peers in each session. Upgrade sessions appear on students' timetables. Please ask your child to show you their timetable and please support our staff by reminding them to attend. Many students feel worried and stressed intherun up to exams. We recommend students keep a good sleep schedule, eat well, get outdoors and do regular exercise to support their well-being. In school, we have Yoga on Tuesdays and Fridays and Headspace, a place for quiet mindfulness, running every day. There are also a wealth of apps available that can be accessed on phones/ tablets at home. 'Headspace' and 'Calm' are two that come highly recommended and offer tips, anxiety advice and guided meditation. Both are available on IOSandandroid and offer free 7 day trials. Both the year 12s and 13s have made an excellent start to the new term, we look forward to hearing about university replies from those year 13s who applied to UCAS for 2019 entry or deferred 2020 entry. Year 13 mock week is 14 - 18 January - all year 13s have been issued an exam timetable, a copy of which has been emailed home. Students should arrive at least 15 minutes before the start of their exam and wait in the canteen to be called down. They must ensure that they have at least 2 pens with them and any other equipment that they need. Those students with EAA (Exam Access Arrangements) should try to remember to make a mark on the paper where their extra time starts - this is useful for evidence of need. Year 12: Core Programme last week was a really useful talk from the Western Outreach Network (WON) regarding Higher Education and course choices. There will be an email circulated soon with the presentation for those who missed it. You will have received an email inviting you to our next PEG meeting which is at RGS on Wednesday 16 January, we look forward to seeing you there. A representative from Bristol University will be there to discuss student finance. There will be a Careers Fair at Ashton Park School (BS3 2JL) on Monday 21 January from 4.45-7.00pm. The event is open to students and parents/carers from any school who are interested in exploring future career pathways, further and higher education, work experience and apprenticeships, with over 60 exhibitors from a wide range of sectors present. No need to book. Clubs started last week and it was good to see a large number attending them. Just a reminder that students needs to wear appropriate sports kit and footwear please. For boys football, students will need to wear football boots and shin pads. Please click here for a list of all of the PE/Sports Extra-Curricular activities available to students in Term 3. A place has become available for the 2019 Easter Ski Trip. If you are interested, please contact Mr Collin collinj@cotham.bristol.sch.uk urgently. A warm welcome back to all students after the Christmas break. Last term Omega house was very busy in the school community and I would like to congratulate all that took part in the various fundraisers and competitions! 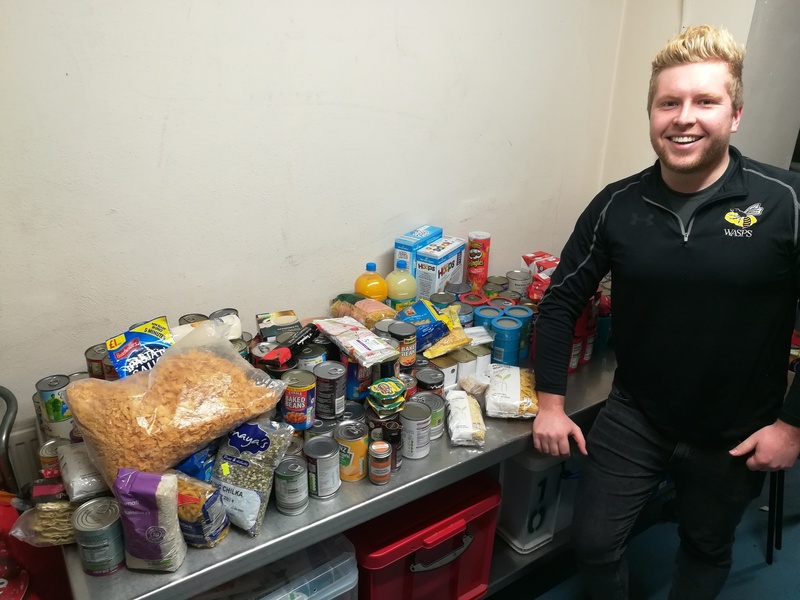 Last term we organised a whole school collection for Bristol homelessness, which was delivered to the Julian Trust in St Pauls on the Friday after the end of term. Thank you to my prefects who were awesome collecting from tutor groups and a huge thank you to all those who kindly donated. Staff and students. The Julian Trust were so grateful for all your donations and they asked me to pass on a heartfelt thank you to all who got involved! We also organised the annual Santa Dash which was a great success, initially our winner this year was, for the second year, Mr Slane however after a VAR replay across the finish line the Fourth Official noticed the offender in non-regulation rugby boots, giving him a competitive edge over all the other competitors. Therefore after disqualification Tazz Clarke-Downer (11WN) was given the overall win. There have been a few students who have stood out over the past two terms and I am pleased to announce that our Omega Legends for term 1 and term 2 were Fab Campus (8JBR) and Nada Marsal (10JSB) Commendations go out to Sion Mowatt (9RM), Becky Lloyd (7KBK), Frank Parsons (8JBR), Avea Archer (11DU), Shawanica Ramsey (11DU), Adam Roe (10JSB) and Hafza Dauud (7KBK). Finally, Omega house was successful in winning the Overall House Trophy for the very first time! Not only this, we also managed to win the trophy for Cotham Manners! A brilliant success, however holding onto the trophy will be an even greater task. Thank you to all my amazing house who have worked incredibly hard in school to make this happen. All the best for the new term, keep on being awesome Omega! Elections for the Bristol City Youth Council elections are taking place from January 14 to January 25 2019 across Bristol. Young people across Bristol aged 11 to 18 will be voting to decide who will be the next thirty two members of the Bristol City Youth Council (BCYC). Cotham School has agreed to be a polling station in the elections of 2019. All students will have an opportunity to cast their vote during a tutorial session where the candidate manifestoes and process will also be shared. Click here to view all candidate manifestos or here to watch a video of each of the candidates. We wish all candidates the very best of luck in running their campaigns, particular good wishes to Theodore Bradwell andDorianErlic who are both Cotham students. We have created Assessment Calendars for 2018/19. Each Assessment Calendar contains details of the class assessments that will take place in their subjects. The final column contains a link which gives information about each of the assessments. Please see the attached link describing our Homework Guidelines for students in the school. In KS3 we do not have homework timetables.